Related Services - Pest Control Service | Tuckerton, NJ | Balance of Nature, Inc.
We replace crawlspace vents to help alleviate moisture and provide ample cross ventilation. A well-ventilated crawlspace will help prevent damage to your wood and insulation. It will also help with general pest control as it prevents moisture thriving insects from entering your home. Cleaning gutters helps prevent moisture build up that cause the breeding of mosquitos or the infestation of termites and carpenter ants. This service can be done at the same time as other insect extermination services we provide. Crack and crevice treatment with copper mesh, silicone or IPF foam. This is a great preventive measure to help alleviate rodent and insect pests from entering your home. After a thorough inspection of your home’s interior and exterior, all cracks and crevices will be applied with a residual pesticide followed by a sealant, depending on the situation. Vapor barriers are typically installed in the crawlspace area to help prevent moisture from rising up and causing damage to your wood and insulation. Again, this aids in the prevention of moisture thriving insects. Brush and Debris Removal in your home and yard. The clearing of brush and debris away from the home takes away the natural habitat that insects, rats, mice cover. Power washing green and black mold off your home helps it to dry faster and not retain as much moisture. This also reduces the infestation of moisture thriving insects like mosquitoes. Bird guards are installed over dryer vents to prevent rats, mice, birds and rodents from blocking the vent with nesting material. This prevents them from damaging your dryer, or even worse, starting a fire. Tree branches should be trimmed far away enough from the home so that ants, insects, and rodents cannot access the roof from those areas. Integrated Pest Management, or IPM for short, is an approach to pest management that strives to be both effective and environmentally sensitive. This approach makes IPM practices especially appealing to certain venues in New Jersey, such as public schools, where judicious use of pesticides and other cautious methods are desired. 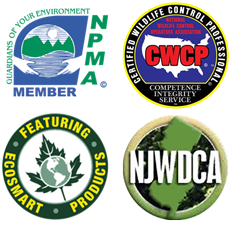 Balance of Nature is one of the few New Jersey Certified School IPM pest control companies in New Jersey. This means that we are permitted to executive IPM practices in schools, or at any other location where IPM techniques are required.